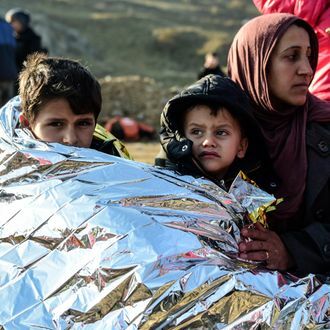 A Syrian family waits after arriving on the Greek island of Lesbos along with other migrants and refugees, on November 17, 2015. The House passed a bill Thursday afternoon that would block plans to welcome 10,000 refugees from Syria and Iraq into the United States. If passed, the legislation would require the head of the FBI, the Department of Homeland Security, the attorney general, and the director of national intelligence to clear each individual refugee as a non-threat. The legislation passed easily, with the approval of 242 Republicans and 47 Democrats, CBS News reports. The White House has called the idea of screening and approving each refugee individually “untenable,” and the president has promised a veto. While the bill doesn’t explicitly say it would stop the arrival of more than 10,000 refugees during the next year, requiring the administration to certify complete background checks for each refugee would certainly complicate the process. Some of the bill’s critics say the vetting process — which can take up to 24 months per application — is already complicated enough, since refugees are already undergoing interviews, biographic checks, and medical screenings before entering the country. More than half of the states in the country have vowed to close their borders to Syrian refugees in the past few days, citing security risks (despite the fact that the Supreme Court has ruled that states cannot overrule the federal government on these kinds of issues). Some cities, including New York, have still promised to welcome them with open arms, and France, the target of the recent bombings, maintains its commitment to accepting more than 30,000 refugees in the next two years.